While the phones in our pockets have been getting smarter and smarter at an alarming rate, bike computers (despite having the word "computer" right in their name) have been lagging way behind. But as sensors, radios, and chips have shrunk smaller and smaller, we've seen more and more intelligence come to the handlebars. The new Edge 1000 from Garmin is trying to pack the most in. First off you've got a three-inch (vertical, not diagonal), color touchscreen. It claims to be easily readable even under the blazing sun, but also has a ambient light sensor, so it can adjust its backlighting on the fly. It can also work while wet (it's IPX7, or rated for exposure to water of up to 1 meter for up to 30 minutes) and is glove compatible. It has built-in Wi-Fi for rapidly downloading detailed map data. 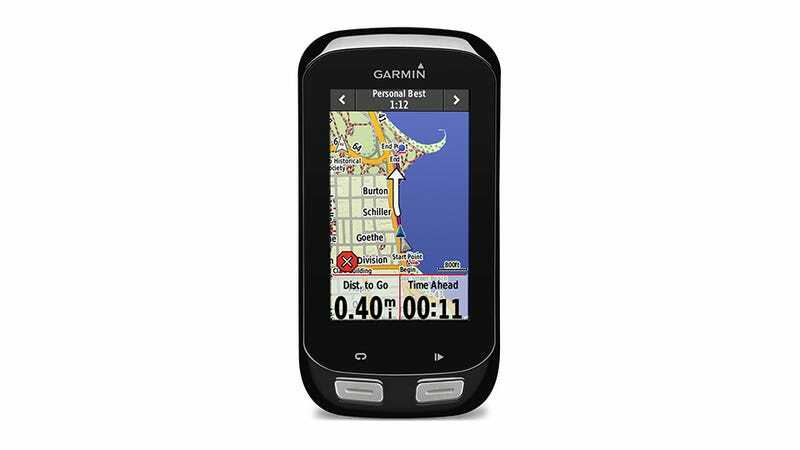 The built-in GPS allows you to do turn-by-turn directions, or just track backwards to your starting point. With an upcoming software update, you'll even be able to punch in a location, then chose from three different routes for how to get there (after perusing elevation data). There's Bluetooth 4.0 as well, for connecting to your smartphone. If you have an iPhone 4S or higher, you'll be able to see incoming text messages and the names of callers on the Edge 1000's screen (likely coming to Android late this year). You can also use the feature to let your loved-ones track your rides/races as you go. The Edge 1000 can also connect to a whole host of different ANT+ sensors, including heart rate monitors, cadence sensors, and power meters. This includes Garmin's Vector, a pedal-based power meter that measures total power, left/right balance, and cadence. Also, if you use Shimano's Di2 electronic shifting systems it will display what gear you're currently in on your screen, oh and bonus, you can use it as a remote control if you happen to have the Garmin Virb action camera. Speaking of remote, the Edge will come with a small remote control that attaches to your handlebars and makes it so you don't have to ride one-handed in order to access the most commonly used features. Pretty slick. One of the interesting things is that Garmin is trying to go after Strava a bit here. Using Garmin Connect you can see who has the top times on various course segments and then virtually race against them. The Edge 1000 displays how far off/ahead of their pace you are, which may provide the extra motivation you need. Or maybe it will make your heart explode. Y'know, just be careful and know your limits. Speaking of, you can also use this feature to race against your own personal best. When you get done with your ride you can upload all of your data to Garmin's site and analyze a ton of detailed metrics about it. Where was your heart beating too hard? Where were you favoring your right leg more than your left? Where were you bonking (yes, that's a term that bikers actually use without irony)? It's all right there in front of you. You should be able to get up to 15 hours of riding time off a charge.